Shakespeare knew that the Roman statesman and commander Julius Caesar suffered from the 'falling sickness'. The assumption that Caesar suffered from epilepsy is backed by several sources dating back to Roman times. For instance, Gaius Suetonius Tranquillus (Sueton, approx. 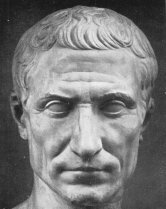 70-140 AD), the biographer of the first Roman emperor ('De vita Caesarum'), reports that Caesar twice had epileptic seizures ('defectio epileptica') while he was working. AAppianus, the Roman historian from the second century AD, also mentions Caesar's 'epilepsy and sudden convulsions' in his description of the republican era. Plutarch states that Caesar had an epileptic seizure in the midst of the fighting during the Battle of Thapsus. Caesar suffered this seizure two years before his death. At another point Plutarch also points out that Caesar did not have epileptic seizures until towards the end of his life. The Roman authors already link Caesar's epilepsy to cerebral sclerosis, while others attribute it to alcohol. This would suggest that in ancient Rome a distinction was already being made between the 'genuine falling sickness' and a symptomatic type of epilepsy.